There are a ton of reasons why I haven’t blogged in a long while. The stresses of life have been challenging me financially, emotionally and physically. These days, I’ve been in such a bad place, a place I’ve never been before. Now I’m aware that Saturn Return is coming very soon for me, and so my life has been difficult over and over since August 2016. So many promises, so much work experience and a constant struggle since I was a child, all for nothing. It’s just one thing after another, and I hope I’m able to figure out what I am supposed to do with my life sooner rather than later, time is running out. I wanted to work in research and academia, but proved that I’m not as intelligent as I hoped so that dream was dashed. Then I decided to focus on teaching, but one thing is holding me back from it so I won’t give up on that dream yet, and the other path isn’t possible as I have no idea what I’m good at or what I could do. I’m at a loss and need to figure out what I can do career-wise. Sure, I’m in the middle of writing 3 novels and one nonfiction piece, but those are my hobbies, they won’t pay my bills or allow me to progress in a field of work. I’m not sure what to do, and no one in a position of career advice can help as they have no idea what I could do either. It’s just soul-destroying that I’ve been working since I was 12 years old and I’m unable to land a job anywhere at the moment. On top of that my spiritual path is something that many of you are aware is a huge deal in my life. If I didn’t have my spirituality when I found it I wouldn’t be alive today, I would have given up on everything after the trauma I went through. The last couple of years have been trying and testing. I’ve not practised as much as I used to, and in doing so I have felt a disconnect from myself too. I managed weekly tarot readings for myself, writing up minor astrological notes, rereading my fave occult teachings, and having intense spiritual discussion sessions with a couple important people in my life. Reconnecting with myself magickally and spiritually is important, and it’s wonderful to know I’ll be focusing on that again. I can say, even though I haven’t shared much about my path, it has developed in its own way and it feels good to know I can touch base and keep going. Eventually I’ll be back into the swing of things and will hopefully get some new videos up and have total control over my path again. Between now and then, I need to keep hoping that good luck will come my way. I’m in the middle of considering going back to university to get a degree in Social Work so I can stay within the Social Care world with much better prospects. I’m just on a mini-journey to get a couple small qualifications that will hopefully allow me to get onto that degree between 2018-19. I’m determined to get an amazing job, with career progression and get my life started the way I’d like to. I don’t want to give up even though it seems like that’s the only option for me. I want my apartment, a job, cats and dogs. Life sure is hard, and it’s an absolute joke, but I want to be happy. Nothing is permanent, right? Categories: 108 Days of Thought, Annoying Thoughts, Lessons in Life | Permalink. This is partly why I haven’t blogged on here for so long, I’m focusing on major events in my life, and can’t discuss those on this site. For those of you who have been checking out my other daliences on my other blogs will also be aware of how hectic and fun life has been for me over the past 2 and a bit years. I’m in my last year at university, but will need to then focus on teacher training and emigrating to Canada to work and settle with my Mr. Things are looking up, and going in a direction I never thought possible, so I’m going with the flow. That also means that I’m no longer in any Orders too, as I’ve been solitary for so long and I’m more suited to that. I’m happy, and want to stay that way. Life has its general ups and downs but it’s fantastic to know how far I’ve come, and acknowledge how exciting it is to be heading into an unknown future full of love. Thank you all for checking out my stuff over the years, and I’m so glad so many of you reached out for conversation or to share advice and tips on life, I really appreciate it. You folks are amazing. Categories: 108 Days of Thought, Annoying Thoughts | Tags: Sy Calaelen | Permalink. I’m currently planning on new videos. I’ve been away for so long due to my university studies, but now that I’m finished and also having a week off before I’m bogged down with work over the summer I thought I would just let you folks know that I’m still here. I’ve been busy blogging and writing posts for my other blogs and I’m sorting out a small profile for another few websites whose editors have been asking for written pieces from me. Things were crazy hectic over the last academic year, but I enjoyed it for what it was. As for my spiritual side I had to slow down. A few things popped up which unfortunately no Thelemic text could help me with, which also lead to my understanding of the term and the various people I have interacted with over that period. I gave myself a chance to slow down and re-evaluate what I had already knew. Considering my last post and the great advice I received from my friends, and that knowledge of knowing what I was fighting against, I stopped, took a breath and continued on. I was also learning tons from my critical theory classes, so I was able to revisit psychological and political criticism and apply those to my understanding of Thelema in the modern world, and my own practices. I was growing, but in a separate pond than other magick practitioners and Thelemites. I’ve mentioned before, and will always continue to push the notion that people who practice magick should see themselves as magicians and hermits. They need to realise that they stand alone, they need to push themselves, and build a personal practice by themselves. It’s wonderful to meet people from various areas within the magick community but if you feel a sense of achievement which reveals that your current teachings need to evolve then don’t fight it, evolve. It is how you grow and become an outstanding magician. The only downfall is the inevitable loneliness that sometimes comes with it. I have found it helpful to discuss the odd topic with Mr Vamp, Mr Darcy and my other close friends in the last few years. You have to remember that I taught myself magick from the age of 11 so basic magick etc got old quick for me. I’ve taught myself and I feel great about that. The last few weeks have been quite the eye opener and I’m still trying to figure what it all means, though I have rough idea. It started with dreams and thoughts of Djehuty/Thoth constantly putting me in situations where I had no control, and the anxiety from those dreams would only dissipate once I let myself stop being so frantic and concentrated on some small physical deed, like controlling the breath or physically letting go of something. I had to apply psychological interpretation to my dreams to understand what my subconscious was trying to tell me. As usual, when your ego is scared of some major change it can skew your vision of the waking world, which for me lead to the confusion between my disciplined magick practices vs. my university studies. There were a lot things going on at the time and one major theme was not knowing where to set my sights for the future. Crowley later gives an example that writing the introduction to Magick in Theory and Practice in Liber ABA is an act of magick in conformity with his Will, to teach and he acknowledges the tools in which he instilled his magick in at the time being the pen and paper. Crowley also gave other examples of what magick is, such as opening a door. For me the same could be said of what I do to keep my mind and body as balanced physically, mentally and spiritually – it becomes my Thelema. So I started providing small examples of my vegan dishes and fitness upkeep with an expected low understanding from folks. Most folks still consider magick as purely to do with spells and rituals. I’ve discovered that this is not so anymore. Some things just aren’t Thelemic, or are they? Apart from psychoanalysing my dreams and also tarot, a deity has also made himself known in my life. He is a deity I learnt about in the various stories from my Jewish and Seventh Day Adventist upbringing. He was never really touched upon much on the Christian side, but still, I forgot all about him until he started showing up. I started asking Thelemites if they could point me in the right direction of Thelemic texts that mention him but nothing came up. I was pointed in the direction of non-Thelemic concepts however, which I had previously looked up which were to do with the Qliphoth. Crowley had something say on those, but nothing in detail about this particular deity. I had to look up other information to satisfy my understanding. I continued to banish anyway, even though I wasn’t fully sure of why Moloch was coming to me. For those not in the know, Moloch is a God who you sacrifice your first born to. I’m child free so I didn’t understand how this theme would come up in my life. As I studied a little further it became apparent that I needed to undergo another lesson in letting go of my original understanding of Thelema due to the many Thelemites I had previously met. Their positions and understanding of Thelema no longer was something I was willing to try and apply to my practices. It just reminded me of the many spiritual people I had met who spend their whole lives searching for something that has always been there. They get old and lay on their death beds wondering if they lead a good spiritual life, reading, practising and regurgitating the old over and over learning very little and ignoring the outside world in the process, and that thought freaked me out. However, that statement does not describe the small number of Thelemites who seem to stay quiet and are at peace in their practices. These folks are quiet and prefer to only talk to like-minded individuals who are also living life in conformity with their Divine Will. In other words, they don’t follow trends and are free of political, egoistic and narcissistic behaviour and the over-zealous fundamentalist attitude that is rife within all spiritual communities, not just Thelema. I think I have learnt more from these silent folks than others, and I like their type of living. At some point I would like to sit down and discuss with people the notion of what is Thelemic and what isn’t, and who says so. Purely to hear the replies. Djehuty, Anpu, Moloch and the Hermit all symbolise the change I need to go through again. Or rather the return to a path without strings. I got so caught up trying to meet as many Thelemites, and trying to discuss ideas and phenomena the same way I do with my main Thelemic friends, that I saw the major culture differences and in so I felt that I found the reason why so many people eventually leave particular orders and the spiritual movement. Djehuty taught me to stop and live in the moment. The Hermit and Anpu reminded me that life is tough and I will persevere regardless. Moloch reminded me to let go of the Capitalist nature of the modern occult world. I’m a well practised magician and that needs to come first always. There’s a divide. Thelema, like many religions, is based on other religions and religious practices. However, if you come into the Thelemic world with a wealth of knowledge then studying Thelemic texts will be insightful, yet you will always know if you want something deeper you go elsewhere. Thelema will point you in the right direction and it is up to you to go in that direction and work on your Great Work, or like many magick practitioners you can sit within the circle and refuse to go out and smell the roses. Either way, as long as you are aware of what you are doing and how you do it, it is all Thelema. I see magick in exercise etc. It’s all magick. It’s all Thelema. However, I gather tons of knowledge from other sources, but their methods are what I would call magick. Since Thelema is based on other practices and theories, then Thelema too is magick. For me, I’m just a magician who happens to be inspired by all kinds of magick. It took me a while to get back to this place, and I’m grateful for it. So here’s the thing: I will still say I practice my own version of magick. I am an occultist who is inspired and educated by so much, especially subjects outside Thelemic thought. However, even though I won’t openly say I am a Thelemite anymore, rather opting for magician, I am practising magick that is line with my Will and Divine Will regardless of other strings and labels. I’ve been told in the past that I can’t be a true Thelemite because I openly practice Buddhism, yoga, mantra, I still enjoy dipping into my childhood religions and drawing conclusions on them. At the end of the day, Crowley did his thing and felt he couldn’t work with a lot of stuff. At the same time he experimented, the way other Thelemites ought to. Just because he hated Buddhism based on his own experiences, does not mean that those observances are applicable 100 years later. I have found something incredible, and it’s for me and me alone. In LVX and NOX, Em Hotep! Categories: Annoying Thoughts, Lessons in Life, Magick, Occult, Paganism, Solitary Witch, Thelema | Tags: esoteric, Esoteric and Occult, Life, Magick, Meditation, Occult, Religion and Spirituality, Spirituality, Sy Calaelen | Permalink. I haven’t been around much online, publishing or posting anything. I haven’t finished the three books I started either. The workload for uni got a little much but I’m focusing on getting as much preparation work done between now and the short research period – which basically means reading ahead as we have our reading lists at the ready. I’ve also been dealing with a police issue that has shaken me quite a bit. Again, for those in the know I’m not bouncing back as quickly as some folks would like, but that’s the problem with being an online figure. If folks had gone through the things I’d gone through as a teenager they would understand why I can’t bounce back so quickly. I’m tweeting when I feel okay and doing the odd bit on my culture Tumblr for those who want to know what’s up. I’m hoping to post a picture from a lecture I attended today. As for lectures, a commenter and my boyfriend reminded me that I’ve been looking at juggling spiritual practice and university work all wrong. I needed to step back and see that living my GW already and just need to focus my attentions on the fact that my studying is my magick right now. I’m still doing the odd daily ritual though – gotta keep the magick flowing through ritual and exercise! Anyhoo, a super quick update. Nothing major. I’m posting on my culture blog and culture Tumblr more, but most people within the magick community still separate magick from life which is why I separated the very magick things that keep me magickal – the occult, critical theory, being a student and books (lots of books and art). Thank you to everyone for the great advice, as mentioned I’ve gotten so used to not being around people and so used to people not listening to me IRL that I’ve found it hard to ask for advice. I always go looking for answers myself. This time I need you folks and you came through. Thank you. Categories: Annoying Thoughts, Lessons in Life, Magick, Meditation | Tags: Life, Spirituality, Sy Calaelen | Permalink. I’m going to admit something I have kept a secret for a long time: I’m struggling at university and struggling spiritually. I have left the odd hints here and there about how busy I am, and how unconfident I am of late. University is an experience unlike anything I had hoped to experience, but it has also taught me how to organise my life more effectively. My problem is juggling it all, and the fact that writing academically has knocked my confidence so much that I cannot bring myself to write anything or upload new content. It has been quite the struggle even though I try to stay positive in/with the things I do publish. I am a nutty kind of person, dealing with general mental issues and trying to learn how to socialise. At the moment it’s all rather too much but I am trying to hold it all together the best I can. As some of you know I’m a second year university student studying English literature which combines history, philosophy, weird algebra styled formulas, basic linguistics, tons of research, writing and reading. I love the course, on paper. I love attending my lectures, seminars and workshops. I also really love the teaching style from some of my lecturers, who are very inspiring and incredibly helpful. Starting the second year I knew it was going to be harder, and a lot was going to be considered as far as timetabling, scheduling and keeping up with the reading lists each week. I had to prioritise how and what I was going to study, and how to write effective essays. I hadn’t banked on how difficult academic writing was going to be but I have been learning all kinds of tips along the way. The annoying thing is coming to the realisation and acceptance that the one talent I had held onto and honed in on was my writing and I was proven to be awful at it. Being shown and told that I don’t know how to write has been heart-breaking and causing a lot of anxiety for me. I’m not sure how or what I’m missing but I wish I could flick a switch and be truly amazing. I’ve had to start all over again which has meant that my detailed journal entries in my book of conjurations has dwindled. I make sure to write every week without fail, but I don’t go into detail in fear that I’ll not understand my own thoughts later on when I do my six monthly catch up. I do however try to remain positive in my thinking and my actions. Every act is an act of magick after all, so retraining my mind has been the most important thing for me right now. I make sure to pull tarot cards a few times a week, and I meditate at least once and I’ve even started seeing my exercise routines to be a form of magick – diet and exercise is key to maintaining a healthy temple. I know that sounds weird but I’ve never been one who leads two lives. A lot of magick practitioners do lead two lives and that is fine, but for me I like knowing that anything I do, read, watch or take part in is a form of spiritual education or attainment. I allow myself to see magick everywhere, but in doing so I also allow myself to be human in times when the world feels shaky or when the ground is crumbling beneath my feet. Juggling a spiritual life has been something I’ve worked hard at for a long, long time. It has also been my own thing, in the sense that it was something I created and it suited me. I’ve spent so long being solitary, and a slightly shorter time hearing about and learning from other magick practitioners, and it has been great. I’ve built up a world that was indestructible and fit me and my understanding of the world perfectly. Of late I haven’t been able to talk to other like-minded individuals, and the ones I have tried to have a general chat with are equally as busy so I retreat into my shell and don’t bother. There have been a few folks however who get access to who I am offline and they have shaken up my world so much that I no longer feel confident in the things I had spent so much time and effort building for myself. Just like my writing they don’t see how pushing me here and prodding me there is causing even more of a rift. I feel as though I’m being told what to do instead of just being accepted and left to my own devices. I’ve always been an inquisitive person, but I could never learn to do the things I did if I wasn’t given a chance, and at the same time I would never dream of trying to change someone else’s path unless they were genuinely doing something wrong or harmful to themselves or other people. I’m again crippled and at a loss. Do I continue to trust myself as I have done for so long, or do I learn not to for the sake of being accepted and moulded into something else? How do I cope with it all? I don’t have an awful lot of time, especially as I thought I’d try to be clever and get as much reading done as possible during term 1. The workload is hefty and somehow, each week I manage to complete everything. I cram daily and on average manage a good 5 hours sleep. The unfortunate thing is knowing my daily rituals have lacked so much. I know I have stressed in the past that something like Liber Resh takes 5 minutes, but back then I didn’t realise how long 5 minutes can be. During my first year I was able to do Resh easily, but this year it has been very bad and I accept that. Our average reading time each week is 40 hours, minus research time and classes, so assuming I can just fit certain tasks into particular hours is impossible. One novel for one of my classes will take an average of 12 hours to read fully and I can’t slot that into “Wednesday reading”, times that by 2 for the remaining 3 classes. Do you see my issue? I just know I’ll be back on track after my graduation in 2016. For now, it is merely a case of juggling the tiny bit of a spiritual life that I have, university workloads and trying to maintain my sanity. Not being able to do the one thing I held so dearly has caused so much secret anguish, terror and anxiety that it is holding me back. I’m not yet sure what to do, and people know I don’t talk about my problems. The negativity, the loneliness, the stress and those annoying colourful ideas that cross my mind demanding my attention stop me in my tracks. When I do grab the odd few minutes outside of studying and spiritual practice I like to do general human things and upload random selfies (which many have complained about, but I won’t stop because I do those pictures for me and my incredibly low self-esteem, which actually is healing my mind a little), cook a few times a week, squeeze in a couple newspaper articles or Tumblr and Tweet things I find interesting. To me this all makes me feel happy, and that happiness gives me the little push I need to get up and study a little more. I’m struggling hard for something major goal in the future; I don’t know what it will be but I want something I can say I worked hard by myself to attain, something that cannot be taken from me, something of my own doing. Will I look back on my life and be proud of myself? Yes. Would I be able to remember the times of boredom that struck when I had successfully completed essays or copious amounts of research? Yes. Social life? Nope, I’m not one for socialising as I genuinely don’t know how to be sociable and likeable. I’m in a weird place at the moment. I will try and get back on track at some unknown point, but for now I will have to allow myself to be a regular, not-so-magickal human for a while. Categories: Annoying Thoughts, Lessons in Life, Magick, University | Tags: Life, Life lessons, Religion and Spirituality, Spirituality, Sy Calaelen, Thoughts | Permalink. ‘And there is another thing that keeps cropping up: such moral and sensible people are always appearing in life, such sages lovers of mankind who have made it their lifetime’s ambition to conduct themselves as decently and sensibly as possible, to enlighten their neighbours, strictly speaking, to prove to them in effect that it is really possible to live both morally and rationally in this world. What then? We know very well that sooner or later many of these philanthropists have, in their twilight years, betrayed themselves by committing some foolish act, sometimes of the most scandalous variety. Now I ask you: what can one expect of man, as a creature endowed with such strange qualities? Yes, showered him with all earthly blessings, immerse him so completely and happiness that bubbles dancing surface of his happiness, as though on water; grant him such economic prosperity that he will have absolutely nothing else to do but sleep, eat gingerbread and concern himself with the continuance of world history – and that man, out of sheer in gratitude, out of sheer devilment, will even do the dirty on you. He will even purchase gingerbread at risk and deliberately sectors heart on the most pernicious trash, the most uneconomical nonsense solely in order to alloy all this positive good sense with his pernicious, fantastic element. It’s precisely his fantastic dreams, his gross stupidity, that he wants to cling to, solely to convince himself (as if this were absolutely essential) that people are still people and not piano keys upon which the laws of nature themselves are not only playing with their own hands, but threatening to persist in playing until nothing can be desired that is not tabulated in the directory.’ —Chapter VIII, ‘Notes from the Underground’ by Fyodor Dostoyevsky. I thought I would share that passage. It’s on point, opens you to that annoying truth, and overwhelmingly hyper-consciousness that we know of people who assume themselves to be bigger and better than other members of mankind. Because they allow themselves to follow a certain set of either individual, or societal rules or “rationalisations” they assume they have it all worked out. As if one of these folks could step forward and say he has found the meaning of life. Yet, in his private world he knows deep down this tiny seed has sprouted into delusion. He has to fight with himself, and question his every move, and every act, both outwardly and philosophically. The only issue there, is that he will see the world differently. If his kin choose not to follow the same methods as he then he feels the obligation to attempt to slew them. He forgets himself, his place within nature and thus becomes exactly what he so inherently despises – less than perfect. I wouldn’t go as far as blaming the ego for this, but some people would rather torch my foundations, figuratively speaking, than help me build upon them. They are so concerned with being so damn amazing (and egotistical – again, gently on ego), that they fail to see it is they who are fluffy. Where is the peace? If they cannot have it, seemingly nobody else can, least of all me (and they don’t even know me from Tefnut! Ignoramus). I’m someone who enjoys questioning the logical and moral way of thinking and living. As Seneca stressed, you should make life an art, and live it as morally (and artfully as possible) whilst holding onto the very sheaths of rationality that you so very much despise, or assume you can overcome. I am currently in a state of flux. I’m rational and irrational – so far life as at art form is definitely arbitrary – but I am enjoying the pleasure, and the pain that comes with it. Over the last few weeks I’ve been doing an awful lot of thinking, and it has come to my understanding that there is a lot to living the Thelemic philosophy, and in doing so understanding how to do it dutifully. I ask myself, how can I teach myself to overcome the wanton reactions from people who seek to hurt and harm me, who also are supposed to live by the same Law I do? The younger me would have let her heart bleed and her tears run free. Being hurt isn’t nice, and it really takes it’s toll on my mind. I’m not 100% sound anyway, but one symptom would be the knowledge that I am indeed sensitive and unfortunately very aware of things, which is what makes me a target. I have been meditating on how to overcome these distractions, these people, and have since developed a serious need to understand and live my life artfully, through Stoicism – by staying in the centre, “on the fence”, or in a flux of some kind, and knowing I have the freedom to move. Like the Hermit, you must work your way through an “Ordeal” by living, practising and learning. How else do you intend on keeping that light shining? The truly naive and “fluffy” are happy in their state of stagnation, and I must avoid them. I must continue allowing the negative people to come my way, and in doing so ignore them. Ignoramus. I’m nowhere near perfect (and I have never stated so EVER), but like I said, I’m going to keep going and see what other philosophical thoughts crop up. I tell you, this path is utterly mind blowing. There is definitely something I need to learn, and I will remain open minded to whatever my Agape is fed from the Universe. 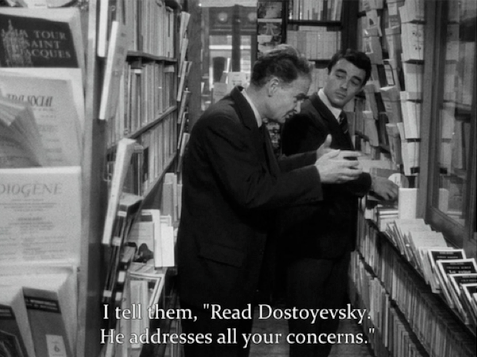 As for Dostoyevsky, yeah I’m re-reading ‘Notes…’ For the second time. He has a weird way of just writing up my thoughts and feelings using his words. It’s not just this novella, but his other works too, like ‘The Brothers Karamazov’ – all too surreal (emotionally speaking). I wonder. I take an awful lot of those silly philosophy quizzes to find out which school of thought I belong to, or which philosopher I’m akin to, and existentialism always crops up. We shall see what happens. I intend on exploring the many philosophies I’ve found mirrored in Thelema over the coming weeks/months. Please help and add your thoughts and comments – I like dialogue. “Puffer” was the original word for “fluffy” – but attributed to failed alchemists. I’m not a failed alchemist. I must remind myself of my experiments since I was 11 years old. Categories: 108 Days of Thought, Annoying Thoughts, Lessons in Life, Meditation | Tags: Life, Meditation, philosophy, Religion and Spirituality, Spirituality, Sy Calaelen, Thelema | Permalink. As I mentioned before, in my last post, I did not like the idea of white-washing other spiritual and cultural practices. When I was much younger, I didn’t mind reading about how to make other practices conform to the ideal that was set out. Bear in mind, this was at a time when Wicca or Neo-Wicca was mixed with an awful lot of theories and ideas, without much reference to the original roots – as if it was the inventor of such ideas. Writers’ would just write up their own experiences, which was fine, without letting the reader know where they learnt particular practices. You had to really dig to find authors who lead you to reputable sources like Cunningham, Valiente or Buckland. It still didn’t give me enough insight into how I would incorporate the other philosophical practices I was trying to study at the time. Buddhism and yoga became the physical aspects of my practices, if you will. With Buddhism I didn’t need to buy a Westernised version of a mantra, or a Westernised Buddha statue in order to have him within the circle with me. The other aspect of Buddhism which did not fit, surrounded the notion that Buddha was a man, merely a teacher. He wasn’t a deity of any kind, so he wouldn’t be allowed to sit on the male side of the pillar, but he could sit somewhere at the side for aesthetic purposes. [Note: – Actually, now that I’m writing this, I’m honestly quite shocked – “aesthetic purposes”. Yes, as some nice people are aware, I am beating myself up, but I need to in order to feel purified. I ask myself, “to what end?” Why did I do this?] I was lucky in some way, knowing that I could listen to my gut feeling and research outside of the given texts. Why had I felt so keen on only celebrating the finer symbols in life? Why didn’t I just ignore the inner feelings of wanting to follow the trends? If they weren’t going to benefit my spiritual growth in any way, then I would just enjoy the knowledge and reap those benefits instead. I delved deeper into unknown territory, but I felt safe in the knowledge that it was a place I was supposed to go. I had to learn about breathing techniques, yoga, effective circle casting, daily regimens, divination, history and the like outside of the Wiccan world. Wicca is a great place to start a life of study, but only if you have the intent of learning one form of magick without staying too long. If you want a lifelong process of soul working, and the ability to become enlightened then stick with witchcraft. Like I’ve said over and over, witchcraft is a practice, not a religion, so it become a big part of your personal life; you live it, it lives with you, and the benefit of just being a witch is knowing you don’t have restrictions. I felt, being different, I could love myself more by not conforming to one ideal. I had always been drawn to the Classical pantheons, and knowing their history, there wasn’t much if any discrimination on the grounds of your sexual orientation or colour. Back in those days, they didn’t pay much mind to it. I stuck with those paths and immediately felt a sense of relief, plus I could put all of my occult knowledge to good use and formulate a spiritual life of my own – which I later realised to be Thelema! Who knew?! The purpose of living a spiritual life is to discover new things, but if one path seems to run out of road, what do you do? Do you go back and start all over again? Do you decide on setting up a homestead where the track has stopped? Or do you become a traveller, intent on finding other sources to bring back? For me, I was and still am a traveller, but I follow my heart’s desire with respect and awe, remembering to learn what I can and following the most important aspects. I won’t go out of my way to white-wash other religions because they don’t suit my own, I will respect them as they are and leave it there. If it doesn’t feel right, I listen to my gut. At the same time, as a blogger and vlogger I feel obliged to let young and impressionable people know what experiences I have gone through so they don’t end up chasing their own tails like I did. An example of doing your thing comes from a friend of mine, who followed Wicca religiously like I did. He practises a form of Hellenism, but found in his early days he often had to view his deities the way Wiccan teachers and books had taught him. He felt his deities were being supressed in some way, being limited to particular functions within the practice and theoretical circle. He didn’t like the idea of limiting Aphrodite to the label of “Goddess of love”, as she had shown him things beyond that. Nor did he fully understand the logic behind mixing pantheons based on those limitations and stereotypes. Being Greek himself, he found Wicca incompatible with his culture, history and practices so he gave up after three years. Maybe Wicca is just limited to mostly one cultural ideal? I’ve spoken to a few Thelemites, but mostly Mr Vamp about how the word “Obeah” is mentioned in the Book of the Law, and he quickly showed me other sources. For those of you aren’t aware Obeah is a form of magick practice in the Caribbean, mostly Jamaica. Last time I checked, Crowley had never been to the Caribbean, nor did he know much about it, but his guide Aiwass knew all there was to know about magick and the New Aeon, while giving Crowley his vision – but the thing that really stood out was the fact that there is a great emphasis on the human condition, and the freedom of being an individual without judgement. I wasn’t about to force myself to keep my soul from singing, just to suit my old books and later the YouTube community, like it says in Liber AL vel Legis, verse 41 “The word of Sin is Restriction!” – Mr Vamp reminded me of Calypso from the Pirates of the Caribbean films, she is an Obeah woman. Most of the areas of my path were centuries old, with thousands of years of knowledge and freedom. Old thoughts and ideas have been developed and practised since, with a few key figures making this seemingly secret knowledge more accessible in their time, and ours. A lot of this life changing knowledge unfortunately falls outside of Wicca, and it takes one in a hundred to brave it outside the circle – and realise they haven’t fallen into some treacherous pit of annihilation, but a world full of incomprehensible beauty. I have found areas within this path of mine to follow even most basic of common sense, and a rigid back bone. It doesn’t matter where you come from, or the Gods you choose to work with, there is always plenty of space, essays and love for them. Like Crowley said above, “Ask and ye shall have! Seek, and ye shall find! Knock, and it shall be opened unto you!” Crowley is a prime example of this technical ideal, as he and friends put together one of the ultimate’s in correspondence charts for magick, Liber 777. Whatever deity, herb, Thoth card or I Ching etc. that you want to use with your own personal magick, you will find other effective tools within it. Whatever it is you want to explore, be aware that magick is a science, you are supposed to theories and experiment, whilst deciding what is important for you as an individual. If it doesn’t make sense, don’t do it. If there is something you want to try and learn, without practising, then that’s totally down to you. Thankfully, I’m able to just pick where I left off as far as occult magick and study is concerned, as there is more than enough room within Thelema. Don’t take any less than what you are. Would you tell her to keep the get up, but limit things to particular ideals? Or would you just let her be the free witch she is? 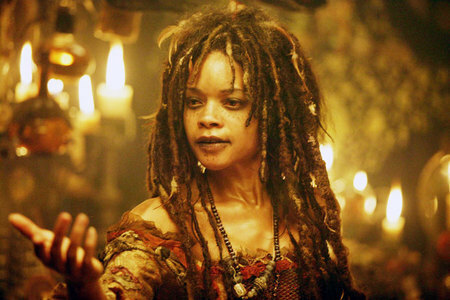 Calypso, from the Pirates of the Caribbean films. An Obeah woman. Categories: Annoying Thoughts, Lessons in Life, Magick, Occult, Solitary Witch, Thelema, Wicca | Tags: Aleister Crowley, Esoteric and Occult, Magick, Pagan, Paganism, Spirituality, Sy Calaelen, Thelema, Wicca | Permalink. Share book reviews and ratings with Magick and Occult Books, and even join a book club on Goodreads. I'll open my mind and let the words spill out of my mouth, but here they'll cover your page and open your eyes. I'm not the stereotype... I'm me. Carpe Diem.